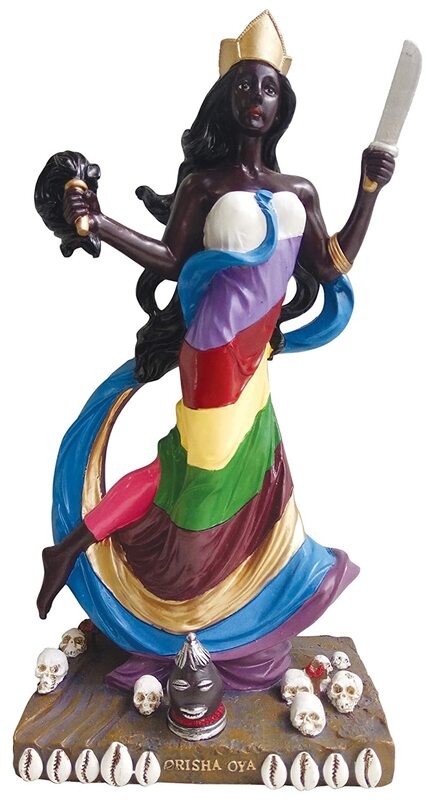 Oya is an Orisha over the winds, fire, rain, storms, transformation, commerce, and the dead. She is an Orisha of hurricanes, tornadoes, thunderstorms and lightning. Her colors are multi-colors, purple or red. Her sacred number is 9. Her sacred animal is the water buffalo. She can shapeshift into the buffalo and is a hunter. She is a warrior woman armed with a sword and protects the sacred from impurities. She is the goddess of transitions and death. Her breath is the life-force of all things and the death of all things when it is taken away. She is a fierce mother who is said to be fiercer than Her husband, Shango. Oya loves eggplants, water, rum, red wine, beer, grapes, plums, and gin. I am the Witch here. I am the one who knows Her herbs. I am the one who knows Her spells. I am the one who knows Her heart. Giving blessings to those who honor Me. A calabash filled with offerings. I bring destruction for new growth to occur. I bring swift cleansing and change. the ones who resist change fear Me. more than their own death. more than their own demise. what you are stuck in. or worse, one where you are a victim. Get out of your own way. Accept My blessings and move. Take action in your life. to help you move forward. For I am Oya, of the Buffalo Horn. Poem previously published in Divine Words, Divine Praise: Poetry for the Divine Powers. Flaming Lioness is now Available!